Well it is our 3 week at Goldfield Ghost Town across from the Lost Dutchman State park in Apache Junction AZ. The riding is great here. We have met some really cool people from all over North America and gone on some great rides. 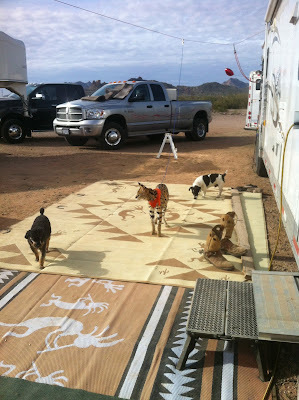 Here are pictures from the ride we did yesterday. We took a trail up to the left side of Superstition Mountains just below the praying hands. Ron ,myself, Sharon, Phoebe and Stefanie Grady from Utah came with us. Meet some nice people at the summit before riding back down the mountain. All our pets are having a great time here too. 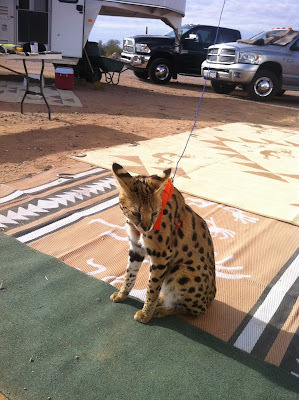 Tigger our Serval loves camping.